When conducting and analysing qualitative user research it is essential to be able to explore the research topic and identify relevant findings. Often we are in an environment where we are working to a tight time span, and don’t have the luxury to review research sessions numerous times, watching and analysing video recordings. In these scenarios I have found it essential to code and theme my research. This helps to identify trends in research and also makes your notes much easier to interpret, which is particularly useful when facilitating the sessions on your own. This article will explore these coding schemes and provide insight into how you might generate appropriate themes. When referring to qualitative user research, I am primarily referring to user testing – one to one user testing sessions following a semi structured interview methodology. The coding scheme used evolves over time and is tailored to each individual project, dependant on the goal of the research. Following a basic structure for the majority of research, coding may include the following: identifying and numbering tasks, classifying observed behaviours, participant quotes, non verbal language, experience issues etc. [I] – Indicates this is an issue that is impacting task completion time/rate. By applying this simple code to your research notes, it is now much easier to review and categorise your findings, rewatching the recording where appropriate. Identifying themes throughout the research process is essential to the research achieving its goals. A theme can be described as an idea you want to validate or a repeating idea that emerges throughout the research process. Themes should help answer pertinent questions relating to the goal of the research. They can be formed before, during or after the research sessions. Typically you will start with an understanding of what you want to find out, from this you can identify some high level themes. Throughout the research process you would iterate, modify and discover further themes. Identifying high level themes is relatively straight forward if the research you are performing has clear goals. Prior to performing the research you may want to explore a certain aspect of the project, for example: participants’ appetite for an online community. Any observations and discussions around this point can then be coded as part of the ‘Community’ theme. Other examples of high level themes might include the navigation or structure of the project. Themes can also form during the testing process. For example, it may become evident that certain terminology is confusing to the participants. Creating a theme around these issues can assist in identifying these problems and lay the foundations to explore more suitable terminology. When reviewing your findings you may identify further themes that were not evident when conducting the research. This is where the coding scheme developed earlier can add further value. Reviewing the codes and comments might uncover that there is a common response to a specific question, which didn’t match the observed behaviour. A theme could be created to group these together and this would potentially warrant further investigation. 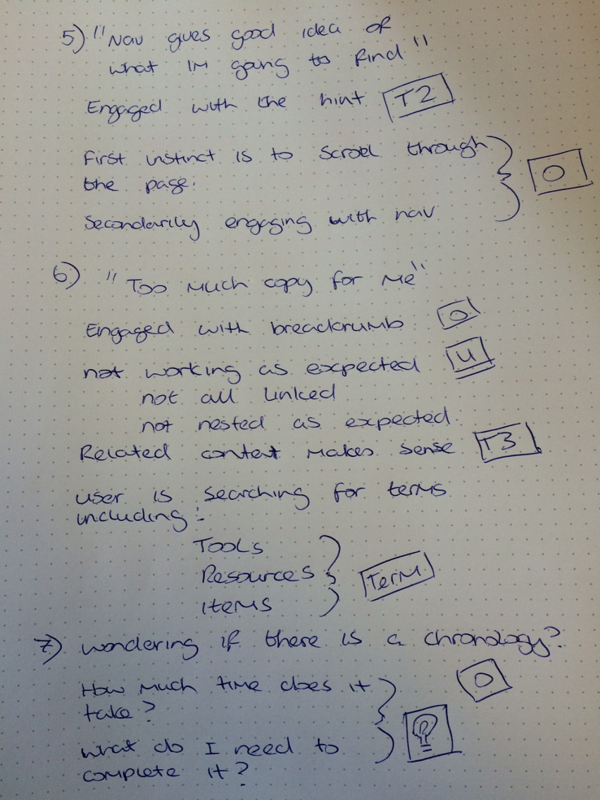 Below is an example of a coding system I used for a recent user research project. It is essential that the coding system is clear to you and quick to apply during the note taking process. 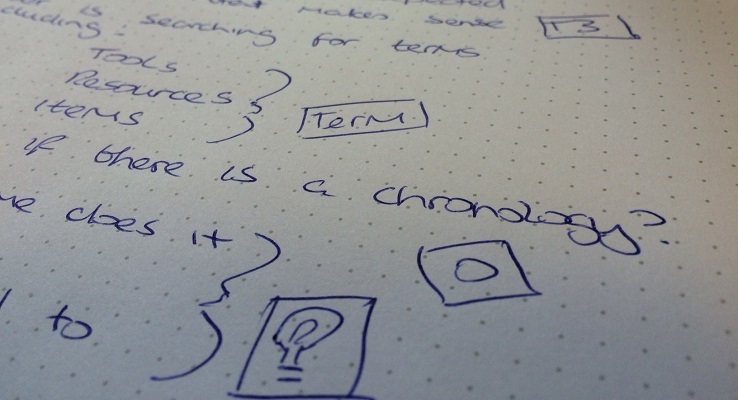 Memory – writing (particularly with pen and paper) and coding observations helps to embed the findings in your memory. By actively creating associations between notes we are creating extra memory cues. Interpretation – it provides you with structured notes that are much easier to interpret during analysis of the research. Time – saves time as you can minimise time spent re-watching the recordings of the research sessions. Findings – Provides the structure for presentation of the research findings. Additional research – Helps identify areas for further investigation.